It's true that any exercise is better none. However, some workout plans are better than others in terms of overall effectiveness. While you may think you’re getting a good workout by spending an hour reading a magazine on the stationary bike, the truth is, if you’re leaving the gym with your make-up still perfectly intact, you’re probably not working hard enough. In fact, if you're able to read a magazine or book while exercising, you probably need to amp it up. So leave the reading material at home, and focus on increasing the intensity of your workout to see the results you are striving for. Whether you’re on a cardio machine or doing some high intensity interval training (HIIT), your heart rate should fluctuate between 75% of your maximum when you’re just starting out, eventually building to 100%. (To roughly determine your maximum heart rate, subtract your age from 220). An easy way to track this is by using a heart-rate monitor that will let you know, in real time, where your heart is at. 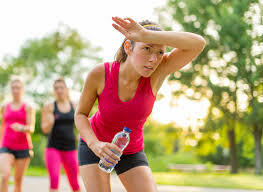 Some people mistake sweating to be the only indicator of working out hard enough, when in reality some people may just be more prone to sweating than others. A heart-rate monitor is simply the most effective way to gauge your intensity level. These days they’re easy to come by and definitely worth the investment. But if you don’t have one, go old school and stop to check your pulse halfway through your workout. A leisurely stroll with a friend is a nice way to pass the time, but not if you expect that activity to help you lose weight. To put it simply, if you can hold a conversation during your workout, you’re just not working hard enough. Short phrases, perhaps, but if you’re able to belt out Taylor Swift while jogging, you need to reassess your workout plan (and maybe your level of shamelessness). No pain, no gain. A good way to tell how hard you worked out is to wait 24 hours and see how you feel. When you exercise, you cause microscopic damage to your muscles. The muscles then adapt, repair themselves, and grow stronger. Basically, you should feel moderate soreness or muscle tightness after a workout; if not, you probably didn’t stimulate your muscle enough to get results. (But not so sore that you can’t go about your regular routine.) Give yourself a day in between to rest and rebuild those sore muscle groups while you work another, alternating days so you don’t overwork one particular group. Once you’ve been on a workout plan for a while and aren’t becoming as sore or tired, it might be time to up the intensity. If you want to gain lean muscle mass and definition, start adding more weight; if you’re using lighter weights to tone up, add some extra repetitions (Instead of 10-15 reps, try 25). If you’re doing cardio, try going a little faster or start incorporating more interval training into the mix. Because your body is constantly adapting, if you do the same thing over and over again, your body won’t be challenged enough to make a change. Be mindful that the more you work out, the more effort you’ll have to expend to keep making progress. Not only do you need to change the intensity of your workout, but also the variety of what you’re doing. Get creative. Fit people don’t stick to one regimen, they cross train. If you’re doing the same set of squats and bicep curls day in and day out, you’re probably creating imbalances in your body (not to mention it’s just plain boring). Don’t be afraid to mix it up. Force yourself to be uncomfortable. If you’re a runner, try adding some yoga and weight lifting. If you only lift weights, try adding -Aerobic Exercise or Pilates into your routine to balance out your body’s ratio of strength and flexibility. You don’t have to do everything all at once, but start by challenging your body to do something it’s not used to doing. That’s not to say if you don’t see results after a week you should give up. After all, how long did it take for your body to get to where it is now? But if you’ve been consistently working out and eating healthfully for more than a few months and you haven’t noticed even a slight physical change—be it a number on the scale or inches lost depending on your fitness goals—then you might need to reassess your routine. It should be a slow progression if you’re doing it the right way, but a progression nonetheless. If you're feeling overwhelmed and don't know where to start, consider hiring a certified -Personal Trainerto get your started on the right track. A small investment will give you the gains you're looking for. CLICK HERE TO START YOUR WEIGHT LOSS SUCCESS! We now accept health insurance! Most of the nutrients of a fruit or vegetable are in the skin, so you shouldn’t peel it. If you peel fruits and vegetables, recognize what you’d be giving up- the nutrients and fiber that the peel contains. Any pesticide residues in foods you buy are present at minimal levels. It’s safe to say that they probably won’t pose any health risk. You can add more to your safety net by the way you handle your food in your kitchen. Wash fresh fruits and vegetables with water to remove residues on the surface and in the crevices. For foods such as carrots, squash, apples, and pears, use a vegetable brush to clean them even more. Rinse well. Avoid soap, (unless it’s a produce wash formulated to remove wax, pesticides, and soil) because it leaves its own residue. Bottom line: Leave edible skins on vegetables and fruits and trim away as little as possible. Most vitamins and minerals are found in the outer leaves, skin, and area just below the skin- not in the center. Peels also are natural barriers that help protect nutrient loss. Eating after 9pm makes it easier to gain weight. The truth is simple- a calorie is a calorie no matter what time you eat it. The number on your bathroom scale will start to climb when you consistently eat more calories that you burn off with physical activity. However, mindless munching in front of the television at night can push calorie intake over the edge. The reason why people may feel sluggish after late-night eating has more to do with overindulging in a grease-, beer- and salt-fest, which can cause bloating and stomach upset. Eat at regular intervals to help avoid extreme hunger and plan balanced meals that include a variety of healthy foods. Studies show that people who skip breakfast and eat fewer times during the day tend to be heavier than people who eat a healthy breakfast and eat four or five times a day. This may be because people who skip meals tend to feel hungrier later on, and eat more than they normally would. It may also be that eating many small meals throughout the day helps people control their appetites. Bottom line: No matter when you eat, your body will store extra calories as fat. If you want to have a snack before bedtime, think first about how many calories you have eaten that day. Be aware of social situations that trigger eating-such as parties, entertaining friends, dating, talking around the coffee pot at work, and happy-hour business meetings. Create your ways to avoid overeating. Food journaling on your i-phone, blackberry, or notepad can help eliminate mindless eating; it’s like a personal diet GPS, helping you stay on course, and navigate around eating trigger. Make a list of fun “non-food-related” activities: enjoy your garden, choose an active hobby as a stress-buster, surf the internet, treat yourself to a massage, or buy something new to wear or read. You probably have heard the expression “you are what you eat.” If you find yourself cranky and tired, you may be able to boost your mood by changing what you eat and when you eat. Certain foods are key components in the manufacture of powerful brain chemicals, called neurotransmitters. Neurotransmitters such as serotonin, dopamine, and norepinephrine may jog your memory, improve performance, improve sleep and boost your mood. The following mood-boosting strategies will help jump start your new year health resolutions. Refined white starch like white bread, crackers, bagels and rice are digested quickly, leading to a dip in energy and rebound hunger a few hours later. Concentrated sources of sugar like soda, candy, fruit juice, jam and syrup can also create radical spikes (and drops) in your blood sugar, which leave you feeling cranky and tired. Good mood foods: To lessen volatile blood sugar swings, include high-quality carbohydrates such as vegetables, fruit, legumes, brown or wild rice and oatmeal. High quality carbs trigger the release of serotonin which enhances calmness, improves outlook, and may lessen feelings of depression. Foods rich in soluble fiber such as flaxseeds, oats, barley, apples, pears, sweet potatoes, peas and beans help slow down the absorption of sugar in your blood, potentially lessening mood swings. 2. Incorporate protein with meals. The addition of protein to a meal or snack will help slow the absorption of carbohydrate in the blood. Dopamine and norepinephrine are released after eating protein, making you feel more alert and focused for hours after eating. Good mood foods: Choose heart-healthy lean protein such as skinless poultry, seafood, round or loin cuts of red meat, tofu, quinoa, eggs, and low-fat dairy. 3. Boost your intake of Omega-3's. Foods rich in omega-3 fatty acids can be mood-lifting. Good mood foods: Choose oily fish (salmon, Atlantic mackerel and sardines), ground flaxseeds, walnuts, canola oil, soy nuts and omega-3 fortified eggs. Wondering whether or not to take an omega-3 supplement? It's always best to get your nutrients from whole foods as a first-line approach to staying healthy. Always check with your doctor before starting a dietary supplement. For omega-3's, look for supplements that contain 650mg of EPA and DHA combined. Folate and vitamin B12 may influence mood by playing a role in serotonin production. Studies have shown that low blood levels of these vitamins are sometimes related to depression. Good mood foods rich in folate: fortified whole grain breakfast cereals, lentils, black eyes peas, soybeans, oatmeal, mustard greens, beets, broccoli, sunflower seeds, wheat germ and oranges. Good mood foods rich in vitamin B12: shellfish, wild salmon (fresh or canned), fortified whole grain breakfast cereal, lean beef, low-fat dairy, and eggs. 5. Don't forget about vitamin D.
Although a link between vitamin D and seasonal affective disorder (winter blues) is still speculative, don't discount this sunshine vitamin. Vitamin D may increase levels of serotonin in the brain. Good mood food sources of vitamin D: fish with bones, low-fat milk, fortified soy milk and egg yolks. Because vitamin D rich foods are limited, it may be beneficial to take a daily multivitamin to reach the recently updated goal of 600 International Units. Check with your doctor before starting a dietary supplement. 6. Stick to a Good Mood Food Eating Pattern. Eating every 4 to 5 hours throughout the day provides your brain and body with a constant source of fuel. This eating strategy can dramatically prevent dips in your blood sugar and it's easy to do! Eat breakfast within 90 minutes of waking up, lunch, an afternoon snack, and a sensible dinner. Limit short-term mood boosters such as coffee, chocolate, tea, and energy drinks which deliver a quick energy surge followed by a crash. The energy boost you may feel is often short-lived. 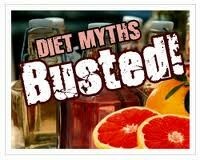 Additionally, many commercial energy drinks are loaded with added sugar and can be quite calorie-laden. 7. Stay hydrated and exercise. Dehydration and fatigue go hand-in-hand. The solution is simple- drink plenty of water (fruits and vegetables count towards your daily fluid intake!) or other unsweetened beverages at regular intervals. Studies indicate that regular exercise can relieve depression and trigger physiological changes that make more energy available throughout the day. If this type of eating pattern is new to you, keep in mind that improvements in your mood may take a few weeks....but you will ultimately feel better!